When you want to change the look of your hair, one of the best options is to put on a wig or weave it. 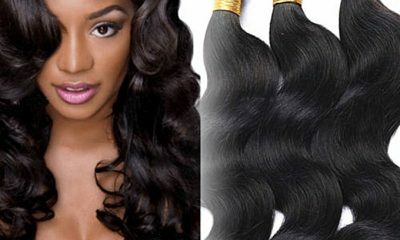 Brazilian weaves are some of the best alternatives in the market. Some of the reasons they stand out is because they are versatile, soft and easy to comb. You can dye a Brazilian weave to attain any colour you want and if you do not want the weave straight, you can have it in curls. One thing you have to remember though is that this is natural hair cut from someone else’s hair and once hair comes off the donor’s head, it stops receiving the much needed nutrients that keep it soft, tangle free, nourished and shiny. It is therefore important that you find ways of keeping the weave healthy, shiny and sift. If you do not, it will lose its softness and tangle. When that happens, managing the weave will become a huge task. Finding the appropriate products to maintain a Brazilian weave may be hard for some people. Some of the shampoos and conditioners in the market are good for natural hair but may not work well for a weave. You need products that contain effective formulas to ensure that the weave keeps its lustre and lasts long. To avoid dry, tangled, unmanageable and damaged Brazilian weaves, we reviewed some of the shampoos and conditioners in the market for Brazilian weaves and came up with the list below. A Brazilian weave does not have to be hard to manage and maintain. All you need is a quality shampoo and conditioner to wash it often to keep it looking shiny and healthy. DeMert Shampoo is a good quality product that will ensure that your Brazilian weave stays clean at all times. The shampoo conditions, deodorises and restores all synthetic and human hair weaves without stripping them of their color. The shampoo is non-greasy ad removes all excess oils from the hair to provide you with an appearance that is more natural. The shampoo does not change the shape of the weave and you do not have to worry about any tangles. The shampoo is easy to use and does not require any other accompanying product to wash the weave. It also has a nice fragrance and comes with instructions. When you put on a weave, both that and your own natural hair need maximum care. You need a shampoo that will not only focus on the weave but will nourish your hair too. Hairfinity Beneath the Weave Shampoo purifies the hair underneath the weave and detoxes it to give a calming clean effect. The shampoo free follicles of build-up and clears any irritants that may interfere with the natural hair without stripping off the natural moisture form the hair or scalp. The shampoo contains quality products such as Tea Tree Oil, Peppermint Oil, Aloe Vera, Collagen and Biotin. If you have any itching, which is common when you have a weave on, then this shampoo will give you relief. To use the shampoo, make your hair wet first, and then lift the Brazilian weave gently, leaving the scalp exposed. Using the shampoo nozzle, apply a small amount of the shampoo on the scalp and massage thoroughly until you feel clean. 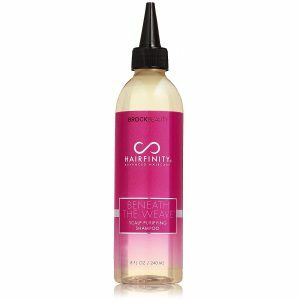 Rinse and follow up with Hairfinity Beneath the Weave Moisture Restoring Conditioner for best results. The shampoo is ideal and safe for all hair types which includes color treated hair. It is free from parabens, silicones, Sulfate, mineral oils, petroleum and phthalates. The first step to delivering superior care to your Brazilian weave is by using a potent shampoo. 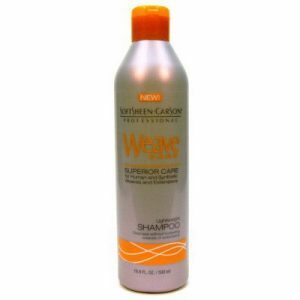 Weave care shampoo is one of the best lightweight products to use for your weave because it not only keeps your weave looking good and strong, but because it takes care of your scalp too. It cleanses the scalp, the weave and the natural hair underneath the weave deeply without damaging any of them or weighing your natural hair and scalp down. The shampoo helps to clear any build-ups that may interfere with the wellbeing of your hair and scalp. The shampoo is good for both synthetic and human hair weaves and wigs. The shampoo extends the life of your weave and it is good for all skin types. There is no other secret to maintaining your Brazilian weave than by using the best products in the market. The above shampoos and conditioners will cleanse your weave, stop the breakages and split ends, prevent any drying and make the weave last longer. The same products will also take care of the scalp and your natural hair. You no longer have to complain about the difficulties that you have maintaining your Brazilian weave. 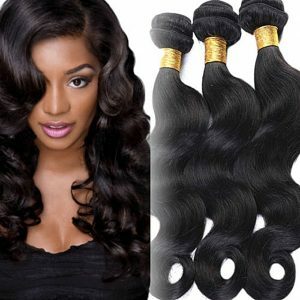 We hope this article was of help to you and you will check out the above products in order to keep that Brazilian weave tangle free and strong.